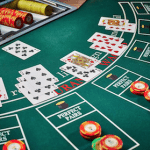 There are many factors behind blackjack’s status as the most popular casino game, chief among them being that the odds and house edge are typically much more player-friendly than in other table games. However, as one of the most variable and least standardised games on the market, there are boundless rule options that can impact your likelihood of winning – one way or the other. Here, we’ll analyses and scrutinise all the tricks a casino might use to lure you in to a poor odds situation, as well as the rules that will improve your chances of success. The term house edge refers to the discrepancy between the player’s odds of winning a bet and the actual payout for that win. Effectively, it is a measurement of the casino’s expected profit based on probability. This is not to be confused with house hold, which focuses on the actual amount the casino earns on any given game or specific tables. The percentages shown for house edges throughout this article will be based on the use of basic strategy in relation to the above conditions. 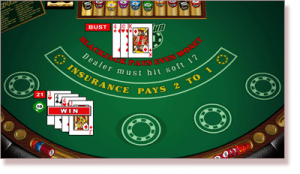 As blackjack often has such a low house edge compared to other games, many casinos fill their tables with rules that swing the favour away from the player and towards the dealer. Indeed, some venues alter their blackjack offerings to the point where they become some of the least player-friendly games on the floor. This is becoming a common killer and should be avoided whenever and wherever possible. While a standard payout for a blackjack is 3:2, there are more and more tables cropping up offering 6:5 odds. Some are even going as low as 1:1. Many experts believe any game paying less than 3:2 can’t rightly be called blackjack, and should instead fall under the broader bracket of 21. This one is especially controversial in Australia, following the introduction of the Blackjack Plus tables at Melbourne’s Crown Casino. In this scenario, the dealer does not bust with 22 points – instead they push with any and all active player hands (besides 21). Countering this is the rule at Crown where players are paid out immediately if they hit blackjack, or any other combination of 21. Additionally, a five-card Charlie pays out immediately. In both of these scenarios, it does not matter what the dealer ends with. However, those two latter rules are not enough to level the playing field when the rule of a stand-off on a dealer 22 is in play. And remember, the push 22 rule only applies to the dealer; if we hit 22, we bust. Think you’ve got a cool hand of 20? The dealer is sitting on a total of 12 and you’re looking pretty, aren’t you? But then boom! The dealer draws a face card and no one wins nor loses. This is an obvious distortion of the basic concept of blackjack that knocks up the house edge by a whopping 6.91%, and severely impacts basic strategy. Normally, the player and the dealer will push if they have equal hands, meaning your bet is returned to you and no cost is suffered. However, there are some variations where hands between 17 and 21 in value are awarded to the dealer in the event of a tie. Though there are a few different combinations that can be used, this is generally considered the very worst blackjack rule from a player’s perspective. When you are dealt a pair with your first two cards, you can usually choose to split them into two separate hands; and if one or both of those hands should turn up another pair, you would then be able to split them again. Some tables don’t allow splitting at all, or will prevent you from splitting certain hands (such as two Aces). This can greatly hinder a player’s betting options and thus the potential to maximise winnings on very good hands. There are some versions of blackjack that only allow you to double down (double your bet, take one more card, and end your turn) on hands of a certain value. A few casinos even go so far as to eliminate the action altogether, which can move the odds – and a lot of money – a long way towards the house. 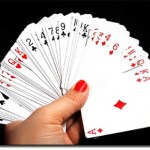 Traditionally in blackjack, the dealer will stand (end their hand) when they reach 17 points. However, a common variation allows the dealer to hit when they have an Ace that can play as either one point or 11 points. For example: a dealer must stand with a Ten and a Seven, but they can hit with an Ace and a Six (which can total 17 or seven). Melbourne’s Crown Casino is one among many worldwide that employ this rule, which improves the house edge by 0.22%. In Australia and most European and Asian games, the dealer will not take a hole card on the initial deal – and, in some American versions, will take a hole card but not check for blackjack until all players have finished their hands. In both of the above scenarios, the player’s odds are directly affected (negatively) if, and only if, any of the following consequential rules are in place (by up to 0.11%), and they almost always are. Blackjack wins all: If the dealer gets blackjack, all bets (including doubles and splits) are lost. This is the worst variation from a player’s perspective. Original Bets and Busted Only (OBBO): If the dealer draws blackjack, you lose all busted bets plus one unit from each un-busted hand on the table. This means you can lose splits, but not doubles. Busted Bets plus 1 (BB+1): If the dealer gets blackjack, you lose all busted bets, plus one more unit from everything else you may have bet from doubling and/or splitting (affects both splits and doubles). This rule is unique to Australian blackjack. The reason why we say the above rules are almost always in place with European format games, and games where dealers do not check for blackjack, is because there is one other rule, Original Bets Only (OBO), which can be used instead. Here, only the original bets are lost on a dealer blackjack, and all other wagers remain. This effectively has the same benefits to the player as when dealer’s do check for blackjack in American variants; it does not affect our odds. Having said that, this rule is largely absent across Australian casinos, found very rarely. Note: The above rules do not come in to play if a player has blackjack. Additionally, in games where the dealer checks for blackjack, the above rules are made redundant because if the dealer does have blackjack, players are saved from wasting bets on splits and doubles – results of players’ hands are determined as soon as the dealer reveals his/her cards. The basic premise of blackjack is already more advantageous to players than most other games, especially in terms of the actions one can take when compared to the dealer. While we usually have the option to double, split, and choose when we hit or stand, the dealer must follow the same procedure for every hand regardless of what cards the player is showing. That said, there are some variations that hurt the casino even further – although many of these can be mixed with other, nastier rules designed specifically to cut down the player’s advantage. Very occasionally, you may find a casino that pays 2:1 for a blackjack. This is good news for you, as long as the table doesn’t come loaded with dozens of other dodgy rules that cancel any benefit from the improved odds. Players already have the advantage against the dealer with a 3:2 payout (dealers only win 1:1 for blackjack), and a 2:1 return cuts the house edge by a further 2.27%. Another version sees the casino award a 2:1 payout specifically for suited blackjacks (ex: Ace and Ten, both of Clubs), which drops the edge down by 0.57%. Simply put, the fewer the cards, the better your chances. While most blackjack games are played with between four and eight standard decks of 52 cards, there are tables that use less. Some casinos even offer single-deck games, but be warned: most of these are traps for gullible players, featuring ludicrous rules that offset any advantage you could gain from the comparative lack of cards. All figures compared to an eight-deck game. Once a fairly common rule, casinos rarely use it these days as it can be very good value for the player. Here, if you draw a certain number of cards – usually five, six or seven – without busting, then you automatically win. For example: in six-card Charlie rules, a hand of 5, 3, 2, 6, A (five cards for 17 points) would win even if the dealer had and Ace and a Nine for a total of 20. This is a first-off action where you can choose to forfeit your hand in return for half of your original bet (with the dealer claiming the other half). In early surrender you can choose to give up your hand before the dealer checks for blackjack, while late surrender on the other hand, can only be taken after the dealer peeks at his hole card. Early surrender is almost never used, while late surrender is semi-regular and can cut the house edge by 0.08%. There are a few blackjack games which allow players to triple their bet after seeing their first two cards. This rule is often used in conjunction with single-deck and double-deck games. Tables that allow you to triple up (or ‘triple down’) on any two cards drop the house edge by 1.64%. This variation is common in video blackjack, where players get an improved payout for making 21 with three Sevens. In many situations where it is used, the 777 is an automatic winner. Games with this rule often feature progressive jackpots.